It’s a tag that I use fairly often. In fact, it’s a phrase I use fairly often as well, and when I’m not using it to refer to the practice of moving two single beds together to form a “double” bed – which will thus have a divide down the middle, rendering it ultimately pointless – I’m using it to refer to the practice of separating “the sexes”, often using the medium of Unbiased Objective Science (TM). I should mention at this point that these links are crazy-making. 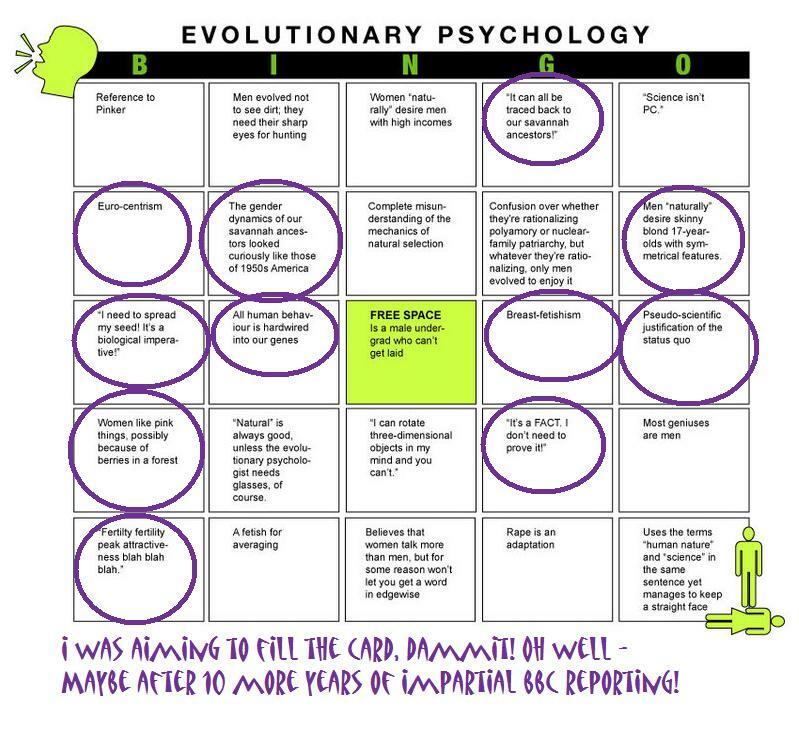 I myself have spent 3 days trying to complete this post, because effectively playing multiple games of EvoPsych Bingo makes your brain melt. I do not recommend looking at them all at once if you have had a bad day. In fact, I don’t recommend it if you’ve had a really good day either, because afterwards you will feel as though you’d had a bad day. They are that bad. If you don’t feel up to dealing with the crazy, I will put up another post soon which is merely angry-making, and hope that that makes you feel better. Thanks go to punkass blog, where the bingo card originated. *I wholeheartedly reccomend reading the The Myth of Mars and Venus, which is both thoughtful and thought-provoking, and thank Kirsten for effectively inspiring this post – she bought me the book for my birthday!